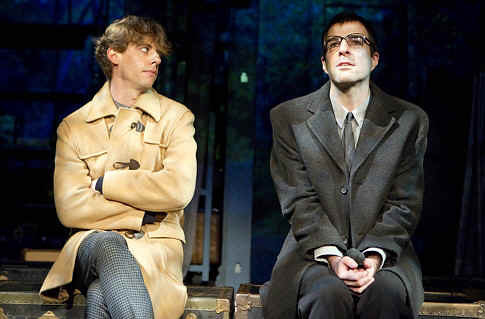 “Angels in America,” Tony Kushner’s two-part epic drama (subtitled “A Gay Fantasia on National Themes”) means a lot to me, having followed it as a journalist since it existed only as an unproduced manuscript being handed around by excited literary managers. I saw the 1991 world premiere at the Eureka Theater in San Francisco (when “Perestroika,” the second play, was still a work-in-progress), and then the first fully staged production the following year in Los Angeles, both parts as they debuted on Broadway in 1993, and then the Mike Nichols movie, which I watched twice. 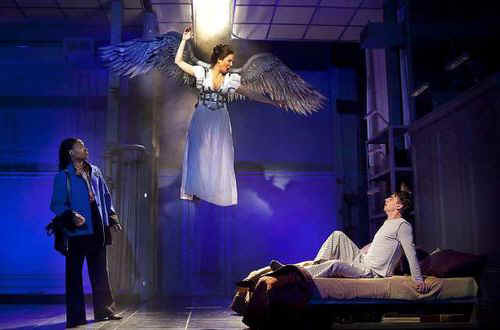 When the Signature Theatre Company scheduled a revival of “Angels in America” as the opening show in its current season devoted to the work of Tony Kushner, I didn’t know if I had it in me to sit through the seven-hour thing again. I was almost dreading it, partly because I heard very mixed word-of-mouth about the cast. Well, forget all that. The Signature revival is a triumph for everyone involved. I realize now that there’s really no canonical production of this play. Each of the iterations I mentioned had strong points and weak points. This production stands up to any one of them, thanks to director Michael Greif, who did an excellent job casting the roles and conjuring fine performances from the actors as well as re-imagining the physical production in a smart, handsome, emotionally compelling, and mechanically ingenious way (with big help from the designers, especially Mark Wendland’s sets, Ben Stanton’s lighting, and Wendall K. Harrington’s projections). I had a multitude of responses in three different directions. I admired and felt deeply engaged with each of the eight actors (all of whom play multiple roles), I had a powerful and extremely personal emotional response to the play, and from a drama-critic perspective I had some thoughts about the work as a whole and how it has evolved over the years. 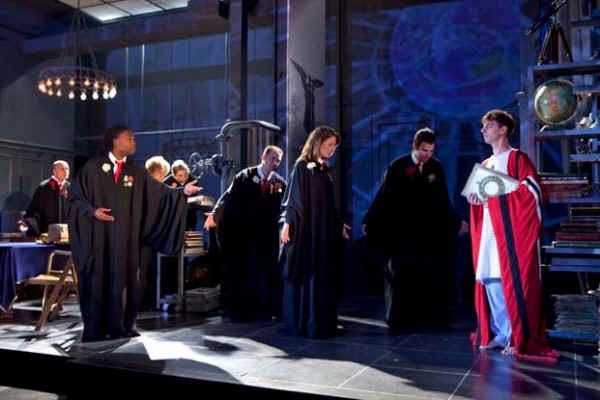 The play must be unusually daunting for actors, considering their predecessors in these roles. I’d only ever seen Stephen Spinella, Kathleen Chalfant, and Ellen McLaughlin onstage in roles that Kushner pretty much wrote for them – Prior Walter, the 30-year-old cater-waiter with AIDS who is the central character; Hannah Pitt, a Mormon who travels to New York in response to an SOS from her married son Joe, who’s just now realized he’s gay; and the Angel who appears to Prior to declare him a prophet with messages to convey between heaven and earth. The other roles have been played by a number of actors, but Jeffrey Wright loomed large as Broadway’s Belize, Prior’s best friend, and the movie version was dominated by a couple of actors you might have heard of before: Meryl Streep (in the Chalfant roles) and Al Pacino (as Roy Cohn, the ruthless power-mongering lawyer reviled by leftists everywhere for his political machinations, who died of AIDS himself in 1986). That being said, each of the Signature actors succeeds in creating a fully developed performance quite independent of any previous associations. Christian Borle (above left), maybe best-known for his lovesick hangdog in Spamalot, is terrific as Prior, especially at his queeniest. Zachary Quinto (above right), unknown to me but apparently semi-famous for playing Spock in the recent movie version of Star Trek, makes an excellent Louis. Besides being handsome with an unusually beautiful deep voice, he captures Louis’s peculiar quality of subtly altering his personality depending on whom he’s with – seductive with Joe, the Mormon lawyer; intellectual and pontifical with Belize; ambivalent and agonizing with Prior. Bill Heck, who got a lot of attention for his central role in Horton Foote’s The Orphans’ Home Cycle, inhabits Joe’s morality, innocence, and sexual torment compellingly. Billy Porter, best-known for musical theater roles, surpasses himself as the flaming yet fiercely stoic ward nurse Belize. Frank Wood’s Roy Cohn (below right) is unapologetically abrasive, pathetic without a shred of sentimentality, a performance characterized by lots of tongue and spittle and a perfect New York honk. Zoe Kazan as Harper gives the weakest performance in the group – perfectly alive and on-target when she’s high on “wee fistfuls of Valium” and communing with Prior in a hallucinatory “threshold of revelation,” but the rest of the time she comes across as childish and shrill. I couldn’t stop comparing to her to Mary Louise Parker, who made a fantastically simple and heartbreaking Harper in the film version. Robin Bartlett (above left) uncannily resembles Meryl Streep when she’s playing Hannah and Ethel Rosenberg, and she manages the same admirable ability to play tough, withholding characters in a way that nevertheless engages the audiences emotionally. Speaking of emotion, I was most affected by Robin Weigert’s performance – endearingly vulnerable as a Salt Lake City real estate agent, hilariously regal and yet rough (and very beautiful) as the Angel, but especially touching as the dykey nurse who tends to Prior in the hospital, the absolute heart and soul of presence with compassion. As someone who lived through the AIDS epidemic in New York City, I couldn’t help be flooded with emotion several times during the play, unavoidably reliving real-life moments that Kushner captures with devastating accuracy. Some of them would grab anybody’s heart, like the scene where Prior reveals his KS lesion to Louis, or the surreal yet simple sight of Louis and Ethel Rosenberg saying Kaddish over the dead body of Roy Cohn. Then there are moments that probably go by quickly for most people but are shattering to survivors. 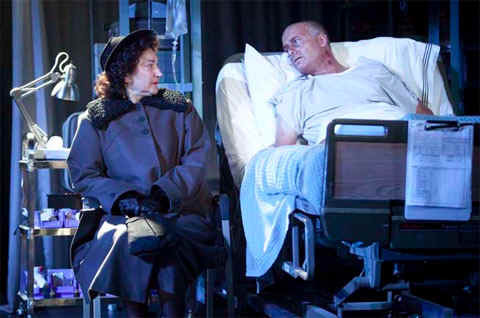 When Louis visits Prior in the hospital the first time, Weigert’s offhanded delivery of the nurse’s remark “We all get to break out hearts on this one” sent me into a spiral of grief that took several minutes to recover from. Looking at it again from some distance of time, “Angels in America” remains an astonishing work of theatrical art, the kind that it’s hard to believe that one person could actually create. Again and again, I found myself in awe of the passages of beautiful language being spoken, the masterly craftsmanship with which Kushner manages the Shakespearean symmetry of the play’s relationship, its deep wisdom about the difficulty of change (in politics and in individuals), and the graceful way he embeds historically accurate details. I like that the play records for posterity a succinct description of HIV and how it works as well as the vocabulary of opportunistic infections and treatment options (toxoplasmosis, CMV retinitis, MAI) that people with AIDS and their caregivers had to absorb. Afterwards, I realized that the first play, “Millennium Approaches,” has been almost exactly the same in every production I’ve seen. It’s an impeccably constructed piece of work that plays like gangbusters every time. The second play, “Perestroika,” is more problematic and has never been the same way twice. All the relationships and all the conflicts that get set up in the first play have to be resolved in the second one, and that gets tricky. There are a lot of plot points to juggle: Lou’s affair with Joe, Roy Cohn showing up on Belize’s ward in the hospital, the supernatural dialogue between Roy and Ethel Rosenberg, Prior’s attempt to understand the “great work” that the Angel expects him to perform. Kushner has done some tinkering with the play that hasn’t necessarily improved it. The messy relationships get soap-operatic at times. The scene in which Prior climbs a ladder to Heaven and confronts the assembly of angels (pictured below) is strangely low-key, like a corporate board meeting. (This was the only scene when Christian Borle disappointed me as Prior – Stephen Spinella was funnier and angrier in this confrontation.) Kushner has added a scene in which Roy Cohn appears to Joe after his death that is just unnecessary, and it also serves to underscore how Joe is the character most left hanging at the end. Some of Kushner’s fiddling has presumably been in response to criticisms of the play. It’s now made quite clear that Louis’s abandonment of Prior is an aberration that reflects badly on Louis’s character, not an accurate reflection of most gay men’s response to their lovers’ illness at the time. I found myself noticing that, in this version of the play, none of Kushner’s gay male characters has any involvement with a larger gay community, which is a strange omission. Kushner was very inspired by the grass-roots activist group ACT UP (the AIDS Coalition to Unleash Power), which was formed in 1987, after the time period of the play, but it’s not as if gay political activism didn’t exist before ACT UP. Of course, it’s asking a lot of Kushner to perfectly capture every single detail of New York gay life in the 1980s. And in a lot of ways, what’s occasionally unsatisfying about “Perestroika” is what’s unsatisfying about life – its refusal to conform to expectation, the unruly chaos of human emotions, the sheer anarchic untidiness of it all.